Like a man possessed, Chapin Harris, the father of modern dentistry, traveled across nineteenth-century America honing a specialty that was undeniably linked to, yet kept separate from, the rest of medicine. In Harris’s time, teeth were a commodity to some, a nuisance to others, and deadly to many. While it was relatively easy to ask patients to perform regular brushing and flossing and to fill caries with gold, the formation of a dental society and school was burdened with infighting among Harris’s associates. For reasons that are more fable than reality now, a school of dentistry was not established at the medical school of Harris’s local university, the University of Maryland. Rather, a new school was formed: the Baltimore College of Dental Surgery. With this act, medicine and dentistry were officially and forever segregated, and the consequences for Americans would echo loudly, and at times disastrously, to the present day. Untreated oral health issues in adults can affect appetite as well as the ability to eat, often leading to nutrition problems. In addition, poor oral health can cause chronic pain that can affect daily activities such as speech or sleep. Oral health problems also affect the ability to work; employed adults lose more than 164 million hours of work a year related to oral health problems or dental visits. Adults who work in lower-paying industries, such as customer service, lose 2 to 4 times more work hours due to oral health-related issues than adults who have professional positions. People with bad teeth can be stigmatized, both in social settings and in finding employment. Studies document that we make judgments about one another — including about intelligence — according to the aesthetics of teeth and mouth. About one-third of adults with incomes below 138 percent of the poverty level (low enough to be eligible for Medicaid in states that adopted the Affordable Care Act Medicaid expansion) report that the appearance of their teeth and mouth affected their ability to interview for a job. By comparison, only 15 percent of adults with incomes above 400 percent of the poverty level feel that way. So, and as usual, if you want dental care, be sure that you choose a wealthy family to be born into, and failing that, pick the right state. Founded in 1991 and launched in 1994 by clinical pharmacist, Gianna Talone Sullivan, Pharm D., headquartered in Pennsylvania and serving clinics in Arizona, Maryland, Pennsylvania and Texas, Mission of Mercy now has 17 clinics providing more than 25,000 free patient visits each year. The Board of Directors, staff, and volunteers that have been attracted to Mission of Mercy were first people whose own prayer life had led them to seek a greater intimacy with Our Lord. While not all of our volunteer staff are of the one faith, in Mission of Mercy each of us has found an expression of that intimacy and actively try to see the suffering Christ in each of the poor we serve. We are a charitable, not a religious organization, and we specifically do not proselytize, yet for the most part we gaze on Our Father and the poor through Christian eyes. For this reason it is not so difficult for us to see the rejection, loneliness, abandonment and suffering that Our Lord endured in the poor He brings to us and allows us to serve. Hence the refreshing lack of complex eligibility requirements that is the hallmark of neoliberal programs like ObamaCare. … covers all sorts of things. Sanders proposes generous coverage that goes well beyond what Medicare currently covers, and even well beyond what many people’s private insurance plans cover. His plan would cover dental and vision care, for example, which are, for the most part, not covered by Medicare. It’s hard to see why I can’t find an endorsement of the Sanders plan on the M.O.M. site. Surely Medicare for All is the biggest mission of mercy of all? This entry was posted in Guest Post, Health care on October 2, 2018 by Lambert Strether. Another way that dental care is second-class: pre-existing conditions can still be excluded from insurance coverage. Recently found out I need a bridge, but my so-called “insurance” won’t cover it since the missing tooth predates my coverage. They don’t want to turn off any major donors. I’m basing this speculation on my own experience, specifically, being employed by one of Arizona’s largest nonprofits (in terms of assets). I worked for this organization for seven years, and believe me, we worker bees had to treat those donors with kid gloves. And why do I refer to these people as donors? Because that’s what most of them were. I met very few philanthropists among them. WE DESERVE ALL OF THE FIVE FREEDOMS. RIGHT NOW. Even better if you can name the foundation after yourself (or a “loved one”) so you/they get free publicity ever time you dole out a few crumbs. I once asked my sister, who taught dental hygienists at the local state university why, with all the money that old folks paid for retirement homes and assisted living, was there no on-site dental care included? Become a carnivore to protect your choppers? At one facility my mother was considering, they have a dental clinic……for extra. They try to get residents from their current dentist to the one at the retirement home. M4A would enable them to continue their generous non-pre-qualified approach to offering care, and also be eligible for government funding. We have found out that in the last 34 years that the major problem for people in this country is dentistry. They can’t afford to go to the dentist. Now kids, they get some of the dental care that they need, but as soon as they leave school, they’re on their own, and by the time they’re getting into their 30’s, they haven’t been able to go to the dentist, and they’re coming to our event by the thousands….but when they’re pressed, they’re going to take the dentist first, then the eye doctor, because they are liable to get all kinds of unhappy things happen to them if they can’t take care of their teeth…the emergency room doesn’t do dentistry. Remote Area Medical is not religiously or famously affiliated, AFAICT. They also lack a statement in support of Medicare for All on their site, although of course Stan seems to support it, judging by his appearance in the town hall. RAM’s Corps of more than 120,000 Humanitarian Volunteers is comprised of licensed dental, vision, and medical professionals who have treated more than 740,000 women, men, and children delivering $120 million worth of free health care services. Upcoming RAM clinic locations include Tennessee, Louisiana, Virginia, and Nevada. Of course, that’s over 34 years. I read about them, but RAM’s focus is not exclusively dental. Agreed, and he/they just stuck in my head from the town hall. But his remarks make it seem like dental is the most in-demand service of what they do (and dovetail with your history on dentistry being the red-headed stepchild–you can get treated by a doctor in the emergency room for free, but you can’t get dental work there). Yes dental care but……on Sander’s bill……read about section 611 b. by Kip sullivan. I share one thing with our esteemed columnist: Being under the competent and gentle care of a Thai dentist. We differ only in location, my dentist is getting a post-graduate degree at New York University College of Dentistry. The Dental College has fees about half those of regular dental clinics which means that it is still frightfully expensive! One problem in New York is that unlike medical practices, dental clinics may have non licensed ownership. This means private equity firms are determining the availability and cost for dental care. (This is true for veterinarians too.) The end result is sky high fees. In my upstate city there are only a few dentist owned practices. Lambert, you are in my mind the pre-emminent health care advocate and reporter these days. I deeply appreciate your efforts and when my (discounted?) treatment comes to a final resting place in my mouth I will hit your tip button. For those who have been drinking the MSM’s “fat otaku happiness” regarding Christianity. Dentists think they are the last Libertarians in America. Medicaid has a billing rule that states a dentist who accepts Medicaid cannot charge a patient more than what medicaid pays for a covered service. FWIW medicaire has the same rule. Three years ago I recieved a bill from a dentist for work done for my two children. The bill was clear, it listed Medicaid payment and the Dentist bill not paid, which wound up on the pay us now line. So I called and said you cannot do this. It is defined as fraud. The billing clerk, well guess. So I get sued. I have to take time off to appear at the District Court in Montcalm County. Represting the Dental Practice is a lawyer who is married to the Dentist. He was a Kavanaugh. In my experience 95 percent of lawyers are. Anyhoo the Judge asks me what my defense is to this collection action. I cite chapter and verse from the CFR. This only makes Kavanaugh more pissed and arrogant as he now realizes he actually has to work as a lawyer to actually collect the 200.00. He and Ms Libertarian Dentist folded, but only after stealing four hours of my life, computed on the basis of a telephone call, research into the CFR, and the 90 minute round trip to the Court plus waiting time. Of course Im leaving out the wear and tear on my 2006 Civic, plus my complete disbelief that a Dentist and her Lawyer husband could be so stupid, plus od course the terror of having to try this case in front of someone who has been elected as Judge precisely for the reason he can be counted on to rubber stamp creditors litigation. Hey, I just realized I was dealing with the Kavanaugh Twins. Separated at birth they came to share not a womb, but a farce. Dental care is generally not covered in Canada’s healthcare system. The primary coverage is employer based. The recent experience of a friend suggests that state covered medicaid benefits needs to be viewed skeptically. According to the chart, CA provides “extensive” benefits, however, this doesn’t speak to the quality of care which may effectively render the so-called benefits moot. My friend had extensive issues with back molars and waited for a Jan 1 rollover when expanded Denti-Cal coverages would help. She was terrified of the limited selection of providers, however, and had high levels of anxiety about being worked on by less than qualified, not-so-professional professionals. Her fears ended up being justified. She suffered an absolutely horrific experience over the course of six months after being worked on by a butcher. Due to an infection and subsequent general antibiotic treatment she developed a severe, life-threatening case of cdif that required two separate extended hospitalizations. After semi-recovery, but unable to wait longer to finish the required dental work, and then unwilling to ever go back to a Denti-Cal provider, she opted to put the cost of qualified care on credit, even though she couldn’t really afford it. At the end of the day it was a very expensive, harrowing experience on multiple fronts. I have several years experience of a MediCal (medicaid) dental provider available in Santa Cruz County California. There are limited number of providers – but for basic dental services – such as teeth cleaning, X-rays, cavities filled, at affordable – or at even no cost. – I am satisfied so far. The providers strike me as competent, so I feel fortunate for this service. (We use a clinic called ‘Dientes”). However, I have not had extensive work done there. We use a clinic called ‘Dientes” in Santa Cruz County – One of the providers available through our MediCal (Medicaid) coverage. So far we have them have used for teeth cleaning, x-rays: basic dental check ups – cost is low – or even free sometimes. The staff seem competent to me. The place is clean.. I have no complaints so far. Then again, I have not had extensive work done. Perhaps my Medicare advantage plan is proactively responding to the Medicare for All movement. I just received a booklet outlining changes to my plan for 2019. The monthly premium is going up by 50 percent and the maximum in-network out-of-pocket amount will be 15 percent higher, which are not surprising. The surprise to me is that preventive dental care, which was previously not covered, will now have a $500 maximum benefit for both in- and out-of-network providers. I called the insurance company to verify that I can use this allowance for having my teeth cleaned. 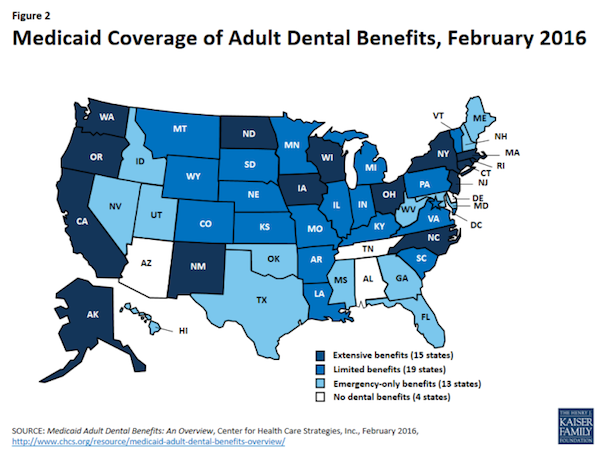 I doubt that this dental benefit would have happened without pressure from Bernie’s bill. I’ll be in the dental chair tomorrow. Already know the bill: $1600. My dental insurance will pay for half; AFTER deducting for Usual, Customary (maximum allowed) Fees for this type of work ($337). So the actual coverage is a mere 40% of the total cost of care. Oh, and the pre-authorization took an additional month of paperwork/phone calls/ email. A good dentist (at a reasonable cost) is actually more important to your health than a Primary Care physician. Some now go to Mexico from U.S. for dental coverage. Helps to live near the border. Literally everyone i know who moved to Texas goes to Mexico for dental care. Granted its under a dozen or so, but still…. I’m smack dab in the middle of Texas, and just about everyone I know goes to Mexico for any dental work beyond routine cleaning or tooth pulling(this last appears to be the go-to procedure for a lot of dental problems among the poors, here…just yank it. $80 last I looked). even folks with insurance, and/or medicare. Veterans and their spouses appear to stay local, which says a lot, I reckon(Tri-Care is regarded as excellent(my Mom has this)). root canals, and such…it’s Nuevo Laredo or Del Rio…where there are whole streets of dental clinics set up for the huddled masses from the Estados Unidos. Do those Mexican dentists call American visitors arriving for dental extractions “yanks” then? I haven’t been to Mexico in almost 20 years…too poor even for this dental plan,lol. but the many immigrants I know do use words like “Yanqui”…in addition to the more usual “guero” and “maricon”(!). I’ve even heard “blanquitos” a time or two. My understanding regarding the Mexican Dentists is that they love customers from El Norte. relatively higher fees for USAians means cheaper fees for locals. as I said, whole sections of towns are set up specifically for dental tourism. Hi Lambert – I’m a practicing dentist and am glad to see you covering dental issues but want to add a different perspective. Medicine is 1000× the mess that dentistry is. The $1600 bill for extensive dental work would be much, much higher if dentistry and medicine had been linked together from the start. What medical doctor have you gone to in the past 20 years where a 1-2 hour procedure, including x-rays and materials cost $1600? Today it would be 10k or more. Yes – improve the delivery of dental care but don’t look to the delivery of medicine as a solution – it’s deeply flawed, with far bigger problems than dentistry. The reason many dentists don’t support Medicare expanding into dental is because dentistry would be crammed into the medical model with all its flaws that are driving doctors out of Medicare and replacing them with hospital owned clinics. Primary pediatric dental care that doesn’t have built in incentives for overtreatment is critical to laying the foundation for lifetime dental health. Medicaid dental care has been linked to overtreatment over and over for 2 reasons. 1. In many states the reimbursement is pitifully low. 2. Corporate ownership of dental clinics focusing on pediatric Medicaid patients are 100% focused on profit margins and have often driven profits by pushing unneeded treatment. Dental care for adults is certainly important too, but if one enters adulthood with good teeth, they have a much greater chance of making it to old age with fewer dental problems. And yes I know that there are bad/crooked/greedy private dentists out there. I suspect the good dentists outnumber the bad, so as usual it is caveat emptor. It isn’t as simple as expand Medicaid or Medicare for all. There must be attention paid to what the outcome will look like once funding is established on a wide scale Wide scale funding of dental may result in the rapid growth of corporate owned offices seeking profit growth at the expense of patient care. I doubt that is the goal here. When the dentist patient relationship is missing, things fall apart. There can be no relationship when there is a revolving door of dentists and a corporate manager demanding revenue growth from their employees. To Arizona Slim’s concerns about donors – the MOM events are well supported by dentists who staff the events and perform the work. Supplies are typically provided by dental suppliers who gladly give because the dentists who buy supplies from them are staffing the MOM event. I actually had no idea this was a faith based sponsor group. There are no “big donors” to keep happy. The House version of Medicare for All HR 676 requires that provider entities be public or not-for-profit. SEC. 103. QUALIFICATION OF PARTICIPATING PROVIDERS. (1) IN GENERAL.—No institution may be a participating provider unless it is a public or not-for-profit institution. Private physicians, private clinics, and private health care providers shall continue to operate as private entities, but are prohibited from being investor owned. Hi Marym – most states already require this under their state dental practice acts. DSO’s (dental support organizations) are the parent behind corporate clinics. It has been described as legal voodoo to allow corporate ownership of dental offices when state laws specifically disallow it. Private equity is deeply invested in this area. I would love to see Lambert do a separate post on this. Here are some links to get him started. Thanks for the links. No doubt opportunities for “legal voodoo” will be endless if we ever get close to having an official M4A effort in congress. My comment was more about my insurance plan; it’s coverage deception and it’s tax on my time. My dentist, though expensive, is Top Tier. As I said, a good dentist is more important than your PC physician (provided you don’t have other serious health issues). I appreciate the insight provided by Beans. Having experienced full-on malpractice while at my local hospital, I can attest to the problems embedded in medical healthcare. While medicine in the US today has MBA’s determining the level of medical treatment by real MD’s that is not the intent or purpose of Medicare for All. Giving a larger portion of the population access to quality health services, including dental care, is the goal. Now it’s time to leave and see my SUPR2TH. We pay outta pocket .. if it can’t be budgeted, it doesn’t get done ! I’m trying to save the $$ for a laminated crown to be placed over a ‘fractured’ molar that currently contains an old filling .. fingers crossed. It’s a race against time vs bite pressure. Here in Canada, we do not have dental coverage as a part of our universal healthcare – at least the UK has some coverage on that front. It’s a real disgrace in my opinion. Granted, there are some good dentists out there for the less well off, but it’s an appalling state of affairs. There is a terrible irony here. My dentist has been forced to offer cosmetic procedures in order to pay his high rent and expenses in Manhattan, because for those who can afford a dentist, there is such effective treatment for cavities and other things (fluoride, eg.) , beginning in childhood, that he doesn’t have enough patients. Yet all over the rest of the country people are walking around with missing teeth and other extreme dental problems. I have dental coverage through my employer. I had thought the dental insurance worked similarly to medical insurance, where you have an out-of-pocket maximum, after which the insurance would cover any additional expenses that year. Boy was I surprised to find out it’s quite the opposite — the dental insurance company has a maximum payout allowance. So after you use up your allowance, any additional cost comes from out-of-pocket! `RT, you need to keep track of your annual ‘rollover’ date for your plan. Read the plan carefully. Learn to time dental work appropriately.